Saint Bonaventure was born Giovanni di Fidanza at Bagnorea in Tuscany in 1221. Almost nothing is known of his childhood, except the names of his parents, Giovanni did Fidanza and Maria Ritella. He entered the Franciscan Order of Friars Minor in 1243 and studied at the University of Paris. In 1253, he held the Franciscan chair in Paris. A dispute between seculars and mendicants delayed his reception as Master until 1257, where his degree was taken in company with Thomas Aquinas. After successfully defending his order against the reproaches of the anti-mendicant party, he was duly elected as Seventh Minister General of the Order of Friars Minor. On 24th November 1265, he was selected for the post of Archbishop of York; however he was never actually consecrated and he resigned this appointment in October 1266. Bonaventure was instrumental in procuring the election of Pope Gregory X, who rewarded him with the title of Cardinal Bishop of Albano and who insisted on Bonaventure’s presence at the great second council of Lyon in 1274. Bonaventure was canonised by Pope Sixtus IV on 14th April 1482 and was declared a Doctor of the Church in the year 1588 by Pope Sixtus V. Bonaventure is known as the “Seraphic Doctor”. His significant contributions led to a union of the Greek and Latin Churches. Bonaventure died suddenly in suspicious circumstances on 15th July 1274, with some sources suggesting he was possibly poisoned. 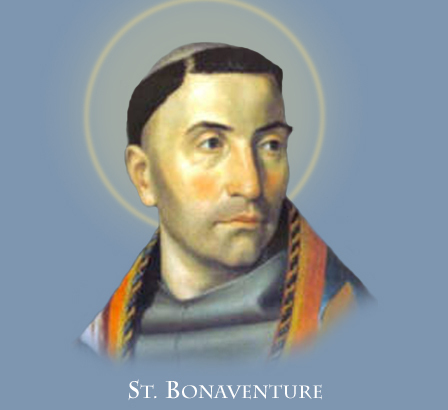 Bonaventure steered the Franciscans on a moderate and intellectual course that made them the most prominent order in the Catholic church until the coming of the Jesuits. His theology was marked by an attempt to completely integrate faith and reason. He thought of our Lord Jesus Christ as the “one true master” who offers humans knowledge that begins in faith, is developed through rational understanding, and is perfected by mystical union with God. Bonaventure’s Feast day was included in the General Roman Calendar immediately upon his canonisation in 1482. It was first celebrated on the second Sunday in July, but in 1568 his feast was moved to 14th July because the 15th July, the anniversary of his death was at the time taken up by the Feast of Saint Henry. Bonaventure’s Feast day remained on July 14th with the rank of “double” until the year 1960 when it was reclassified as a feast of the third class. In 1969, his feast was again reclassified as an obligatory memorial and was assigned to the date of his death on July 15th.